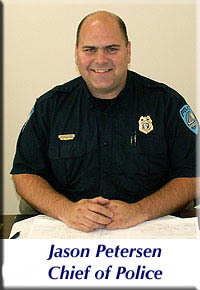 Welcome, and thank you for visiting the Okoboji Police Department web page. The Okoboji Police Department strives to provide a safe and comfortable community for the citizens and visitors of Okoboji. We provide this with the highest level of integrity and dedication. We want all people in Okoboji to feel welcome and safe. The Okoboji Police Department has four full-time officers and one part-time officer. We attend regular training to stay current with new laws, tactics and techniques. With the closeness of the communities in the region it is essential to work together with neighboring agancies and communities. We enjoy a great working relationship with them. The members of the Okoboji Police Department strive for a close relationship with the public also. Our officers want the public to feel comfortable approaching and speaking with their police officers. We are here for you. We encourage citizens and visitors alike to contact the Police Department with any concerns or comments. Please, take some time to learn about our officers and Department. We look forward to hearing from you.